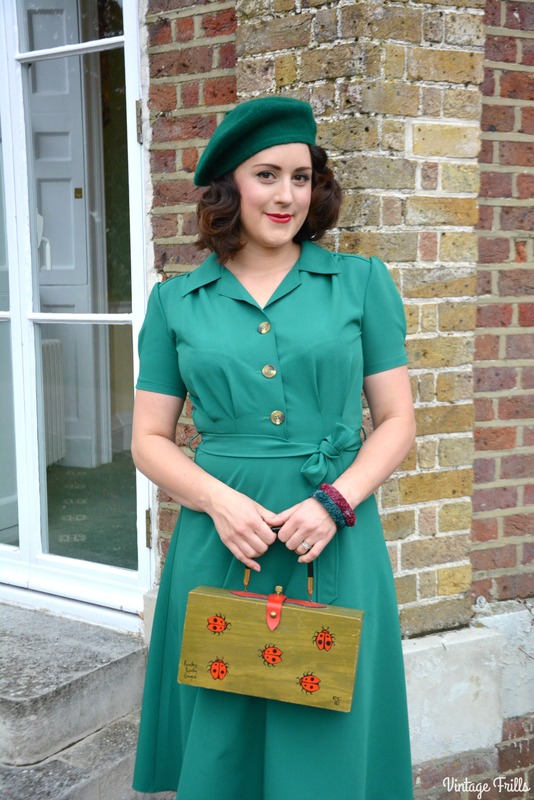 A few months ago, I reviewed a beautiful floral 40s style dress from new brand Pretty Retro. As I said in that review, the dress would be perfect to wear to 1940s events. Last week I received anther gorgeous dress from them and this one is every bit as lovely and a very authentic tribute to 40s fashions. For those of you unfamiliar with the brand, it comes from the creators of established repro brand The House of Foxy, and is an affordable range of staple items for a vintage wardrobe. The range consists of several dresses as well as a great range of separates. 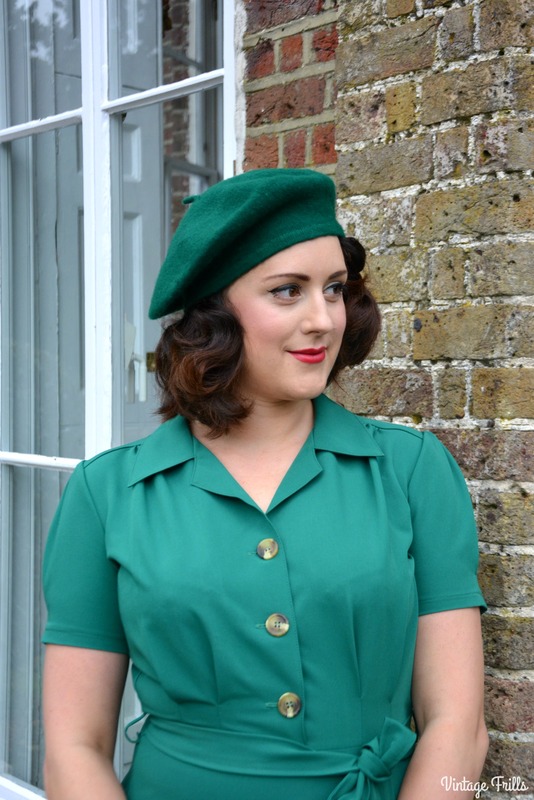 The dress in todays review is the latest new addition to the collection and comes in a choice of green and red. Since green is my favourite colour and I don’t have nearly enough of it in my wardrobe, I knew it was the perfect dress for me. I love the simple shirt style and all the extra details are really flattering. The dress has pleats and tucks in all the right places, giving it a very authentic vintage feel and setting it a cut above similar reproductions I’ve tried. I love the slightly padded shoulders and larger buttons which finish the look of the dress of perfectly. When it comes to fit, I went for a size 14 which is my usual size and it fits perfectly. The side zip allows for a perfect fit and it was lovely to have a shirt dress which doesn’t gape at all at the bust. The length falls just below the knee, which is just right for the era. The dress is made from a poly, viscose and spandex mix, which acts in the same way as a traditional 1940s rayon. I will definitely be giving the dress a spin at any 1940s events I go to. I’m quite tempted to buy it in the red too, as it’s such a useful dress to have in my collection. It is also perfect for everyday wear, as it’s really comfortable and classic and it can be machine washed, so it’s practical too. At £59 it’s a great investment piece that can be worn year after year. I wore mine with a beret which I picked up on Ebay, some Cath Kidston bangles, a vintage Enid Collins box bag and my Clarks Orla Kiely shoes. I love mixing up my eras a bit, but I’d probably wear some classic brogues with it to an event. Check out the full range on the Pretty Retro website. *Thank you so much to Pretty Retro for sending me the dress for review. All opinions as usual are entirely my own. I adore this, the colour and style are beautiful on you!